Learn about the work of multiple clinicians and teams of clinicians who have been recognized by specialty societies for leading efforts to reduce overuse in health care. 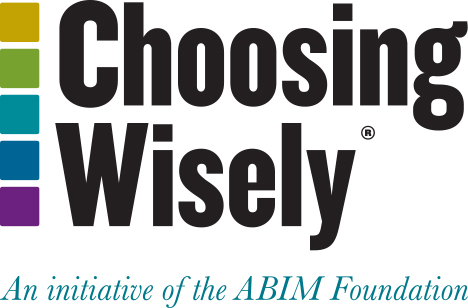 The Choosing Wisely Champions program launched in March 2016 to recognize clinicians who are leading efforts to reduce overuse and waste in medicine. The program was created to acknowledge the work of those dedicated to providing appropriate care and encourage others to follow their lead. playing a leadership role in developing society recommendations. Dheeraj Mahajan, MD, CMD (2018) – Dr. Mahajan designed an initiative to reduce the incidence of urinary tract infection (UTI) in nursing home patients transferred to emergency departments. Anuj Bhatnagar, MD, CMD (2017) – Dr. Bhatnagar teaches nursing and front-line staff about the fundamentals of assessing urinary tract infections (UTIs) in older adults. David Smith, MD, CMD (2017) – Dr. Smith educates prescribers about acute UTIs and the use of antibiotics. Kristin Sokol, MD (2016)- Dr. Sokol works to improve care for asthma patients and reduce overtesting for food allergies. Sean Donahue, MD (2016) – Dr. Donahue’s efforts include initiatives to ensure children don’t get glasses they don’t need. Jean Ramsey, MD (2016) – Dr. Ramsey has led efforts to defeat state legislation mandating pediatric comprehensive eye exams, instead requiring that all children undergo vision screening prior to starting kindergarten. Mark Baker, MD (2018)- Dr. Baker led a system-wide Choosing Wisely committee at Hawaii Pacific Health System in Honolulu, Hawaii; promoted incorporation of Choosing Wisely recommendations and decision-support tools into their electronic medical record; and gave numerous lectures and interviews on best practices for incorporating Choosing Wisely recommendations into emergency care. Christina Creel-Bulos, MD (2018)- Dr. Creel-Bulos launched a program at Washington University in St. Louis, Missouri to promote use of palliative care in the emergency department and led teaching sessions for both residents and nurses to support this change in practice. David Zodda, MD (2018)- Dr. Zodda and his team at Hackensack University Medical and Trauma Center designed and implemented a series of institutional paradigms based on Choosing Wisely recommendations, including one focused on appropriate spine imaging. Jeffrey P. Kanne, MD (2017) – Dr. Kanne helped create multiple ACR Appropriateness Criteria and reduced routine ordering of daily chest radiographs for patients in intensive care, and routine pre-operative chest radiographs for asymptomatic, low-risk patients. Alina Sibley, APRN, BC (2018) – At Baystate Medical Center, Ms. Sibley led a Geri-Pal interprofessional outpatient team that facilitated training for nurses and other Baystate staff, which helped reduce the use of restraints, antipsychotics, and benzodiazepines—a critical priority from the American Geriatric Society Choosing Wisely recommendations. Eric Anthony Lee, MD (2017) – As co-chair of the High Risk Drugs in the Elderly Committee for Kaiser Permanente, Southern California, Dr. Lee is a recognized authority on appropriate prescribing for older men and women. Ariel Green, MD (2016) – In addition to incorporating Choosing Wisely in her practice, Dr. Green has helped educate her colleagues, patients and families through local, national and international meetings. Heidi Ann Courtney (2016) – Courtney’s work has resulted in more than a thousand drug adjustments for patients, including an effort aimed at delirium prevention that decreased incidence from 20.8 to 15.1 percent in the first year. Anuruddh Kumar (A.K.) Misra, MD (2016) — An early adopter of Choosing Wisely, Dr. Misra incorporates regularly uses Consumer Reports’ Choosing Wisely materials to help educate patients on a one-on-one basis in his clinical practice. Ila Singh, MD, PhD (2018) – Dr. Singh created the Clinical and Laboratory Standards Institute (CLSI) document on test utilization, and her membership on the national committee on Lab Test Utilization and Stewardship that co-authored the consensus document on the subject. Curtis A. Hanson, MD (2018) – Dr. Hanson led the incorporation of laboratory utilization rules into the inpatient hospital practice and Mayo’s clinical decision support tool. Diane George, DO (2018) – Dr. George led a group at Henry Ford Medical Group in Detroit, MI to establish a baseline of ordering volume and developed an analytics tool to monitor total volume, as well as highlight low and high utilizers. Within the first year of implementation, the number of Vitamin D orders decreased from 685 per month to 150 per month, and the number continues to decrease at an annual rate of 23 percent. James Littlejohn, MD, PhD (2018) – Dr. Littlejohn evaluated data pulled from the operating room’s electronic medical record and worked with a team to produce an intuitive user interface for the perioperative transfusion dashboard. The team then strategized the best approach to begin a perioperative blood management campaign, and produced and administered a survey on perioperative red blood cell transfusions. Heather Signorelli, DO (2018) – Dr. Signorelli for created laboratory stewardship programs for two hospital markets that led to an annual savings of over $2 million. Jack Jordan, MA (2017) — As Director of Performance Excellence and Quality at Henry Ford Health System, Dr. Jordan worked to make the utilization of laboratory services evidence-based, safer and compliant with Choosing Wisely recommendations. Meghan Kapp, MD (2017) —Dr. Kapp served as a founding member and co-chair of VUMC’s Choosing Wisely steering committee, educating house staff and faculty about the potential harm of daily labs, encourage discussions of lab results and the need for future labs during rounds and provide data feedback with peer comparisons. Christopher Polage, MD (2017) — Dr. Polage published peer-reviewed research that contributed to the Infectious Diseases Society of America’s (IDSA) Choosing Wisely recommendation for clinicians to avoid testing for a Clostridium difficile infection in certain situations. Massachusetts General Hospital, Department of Pathology (2016) — The Division of Laboratory and Molecular Medicine within the Department of Pathology hosts a highly active, division-wide laboratory utilization management program that includes participation from all division faculty. Cedars-Sinai Health System (2016) — Cedars-Sinai has seen an annualized cost savings of more than $6 million and improved the quality and safety of care from implementing Choosing Wisely recommendations across the health system. Geisinger Health System (2016) — The Geisinger Medical Laboratories has tackled various test utilization opportunities in anatomic and clinical pathology using a variety of modalities to effect change. Dana Altenburger, MD, FASCP, FCAP (2016) — Dr. Altenburger has decreased inpatient blood product usage by 46% over three years. Ilan Rubinfeld, MD, MBA (2016) — Dr. Rubinfeld has spearheaded several laboratory-related initiatives and projects. Patrick Hughes, MD (2016) – Dr. Hughes and his colleagues developed a tool called The Guide to Ordering Stress Tests to help referring physicians recognize when a stress test may not be appropriate for a patient – either because the patient was too low-risk for the test to be helpful or the patient was at such high-risk that a stress test might actually be harmful. Adam Binder, MD (2018) – Dr. Binder and his colleagues at Montefiore Medical Center developed a process improvement initiative to increase the appropriate use of vancomycin for neutropenic fever over a 10-month period. This initiative led to a 17 percent increase in appropriate prescribing. Ming Lim, MD (2018) – Dr. Lim helped implement a centralized hospital-wide protocol that coordinated testing and treatment of patients suspected to have heparin-induced thrombocytopenia (HIT), which led to improved testing and management of these patients and substantial reduction in the use of direct thrombin inhibitors. Prakash Vishnu, MD (2018) – Dr. Vishnu and his team at Mayo Clinic in Jacksonville, FL, designed and set up an electronic medical record-based restrictive RBCt program as part of a quality initiative at Mayo Clinic’s hematopoietic stem cell therapy center. Clinicians, hematology trainees and nurses were educated about this program with weekly didactic sessions, pamphlets, and verbal instruction for two months. The intervention ultimately led to a significant decrease in transfusions and an estimated cost reduction of over $22,000. Yulia Lin, MD (2017) – After observing a patient who was eventually determined to have iron-deficiency anemia (IDA) repeatedly visit the emergency department and receive repeated transfusions, Dr. Lin and colleagues worked to reduce inappropriate transfusions for patients with the same condition. Matthew Schefft, DO (2017) – Dr. Schefft and colleagues used individualized pain plans (IPPs) to reduce pediatric emergency department admission rates for children with sickle cell disease presenting with vaso-occlusive crisis (VOC), a frequent event for children with the disease. Marc S. Zumberg, MD (2017) – Dr. Zumberg and his colleagues worked with the College of Pharmacy and local blood bank to create institutionally approved indications for use of recombinant VIIa (rVLLA), prothrombin complex concentrates (PCCs) and blood products. Maria Juarez, MD (2016) – To address variability in blood utilization across Baylor Scott & White Health’s hospitals, Dr. Juarez and her colleagues developed an institutional clinical practice recommendation, modified transfusion workflow in the electronic health record (EHR), and launched an educational campaign (“Why Give 2 When 1 Will Do?”), resulting in single-unit transfusions increasing by approximately 17 percent. Javier Munoz, MD (2016) – Dr. Munoz and his colleagues at Banner MD Anderson Cancer Center implemented an intervention designed to test whether an automatic alert in an EHR could remind clinicians to carefully weigh the anticipated benefits against the risks of post-treatment imaging scans for patients with lymphoma, and resulted in reducing the overall number of imaging studies from 48.3 to 25.3 scans per month. Ravi Sarode, MD (2016) – After discovering approximately 85 percent of thrombophilia tests at UT Southwestern’s two teaching hospitals were ordered incorrectly or incompletely, Dr. Sarode’s team developed local guidelines and implemented them in the EHR via a series of cascading questions that providers must answer before ordering tests. After implementation of the intervention and an associated education campaign, UT Southwestern has reduced thrombophilia testing for inpatients in the university hospital by more than 90 percent. Chris Johnson, MD; Nadine Gauthier, MD; Angeline Law, MD; Eugene Leung, MD; and Calvin Thompson, MD (2018) – The winners from The Ottawa Hospital spearheaded the project, Feasibility & Initial Results of a Decision to Test Algorithm Using DASI in Operable Lung Cancer Patients. Felix Krainski, MD, Besiana Liti, DO and William Lane Duvall, MD, MASNC (2016) – Drs. Krainski, Liti, and Duvall were selected as winners of ASNC’s Choosing Wisely Challenge for their submission “An Outpatient Pathway for Chest Pain Visits to the Emergency Department Reduces Length of Stay, Radiation Exposure and Is Patient-Centered, Safe and Cost-Effective” that proposed a novel testing algorithm for low-risk patients presenting to the emergency department. Mitchell Humphreys, MD, Peter Black, MD and Ithaar Derweesh, MD (2017) – As part of their participation in the AUA Leadership Program, Drs. Humphreys, Black and Derweesh conducted a membership survey focused on adherence to Choosing Wisely statements, with a focus on the AUA’s first list of recommendations, and worked with electronic medical record vendors to incorporate clinical decision support into systems to alert providers to the AUA’s recommendations. Danil Makarov, MD (2016) – Dr. Makarov has conducted research on physician adherence to clinical practice guidance documents that demonstrate the need for educational tools to inform appropriate care.